According to different people's special details, like the body weight, the height, degree of stoutness as well as individual habits and customs, like and so on, when selects and purchases the bedding should act according to own special details and the local climate overall evaluation chooses.Among them, the most basic request is lies supine when can maintain the lumbar vertebra in front of the physiology raised, the bodily curve is normal; Lies on one's side when by does not cause the lumbar vertebra curving, the side curved primarily. 1) Looking on the mattress: See whether the appearance of uniform thickness mattress; four perimeter is straight smooth; mattress surface coverage is symmetrical; whether to use a thick mattress pad filling material; fabric dyeing pattern is uniform; if there are broken sewing needle, needle jumping and floats and other defects. 2) Hand-pressure: Hand-pressure test mattress should be feeling moderate hardness, and a certain degree of resilience. If depressed uneven phenomenon, indicating poor quality mattress spring wire. Qualified spring flapping under elastic good, and there is even a spring song; rust or poor spring squeezed tend to creak of friction sound. 3) Lying on the mattress: Lying on the mattress surface, pressure test and feel the filler is evenly distributed and load bearing capacity is complete. Hand down to the neck, waist and hips to the thighs between these three distinct areas inside the curved stretch, to see if there are no gaps; side stand again, using the same method to try curvy parts and bedding of there is no gap between. If you do not have to prove that the mattress and sleep in the neck, back, waist, hip, leg fit the natural curve appropriate, mattresses moderate hardness. 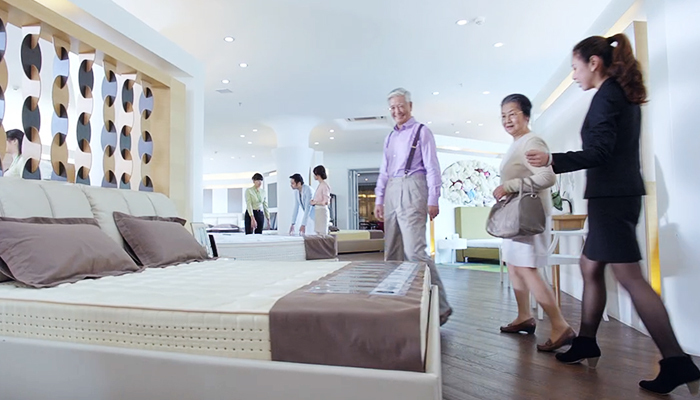 4) Checking the factory indentification label: Check whether the mattress factory identification, quality assurance and certification, mattresses around the edges with a zipper device can be opened directly inspect the inside is clean and odor-free bedding material. After selecting the mattress, which was erected, to see whether it is established, then the frame can be relatively hard real mattress.